The relief you need from everyday cuts and scrapes is available at Sportaid in the form of Hydroactive Paste for Wound Care. 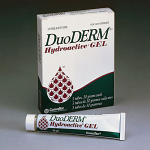 Opt for DuoDERM Hydroactive Paste available at Sportaid.com to protect you from infection and better care. The Hydroactive Paste offers quick and safe recovery. It prevents injuries from turning bad and provides an optimal moist healing environment throughout the duration of the treatment. If used as the cover dressing, the paste helps in the speedy healing process and relieves discomforts. Shop Sportaid and find a great deal on a 30 gm one-time use tube of DuoDERM Hydroactive Paste. Enjoy the sterile hydrocolloid paste that is superb for managing dermal ulcers. Get in touch with our experts at 1-800-743-7203 to make sure you take home what you need. Save BIG on Hydroactive Paste for Wound Care at Sportaid today! We guarantee satisfaction for all customers from Sportaid's first customer to today's first time visitors. After over 25 years in the business helping people find DuoDERM Hydroactive Paste at the lowest prices, we continue to lead the industry! We carry a large selection of wheelchair cushions, wheelchair parts, and wheelchair accessories. We are capable of beating any competitor's advertised price, just call! The staff at Sportaid has more than 50 years experience in customer service and over 90 years of combined exerience using wheelchairs. We look forward to working with you!